Many people have a desire to convert their pieces of land to marvelous masterpieces of beautiful scenery, but they hardly know the right landscaping professionals to contract. 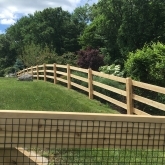 At Redding CT we have skilled personnel who will help you transform your land into an excellent piece of property by offering you the best maintenance services, masonry work, and fencing services that will enhance the aesthetic appeal of the area and improve its value in the market. Safety and efficiency are integral values to the quality work our experts are trained to do. The exceptional services our company is famous for the result of the diligence and dedication of our staffs. Our proficiency and expertise in landscaping is a result of the wealth of knowledge we have acquired through years of experience in nurturing trees, perennial plants, maintenance of shrubbery and moderate water usage. We are skilled at identifying unique types of trees to suit different landscapes and cultivating first-class shrubbery and flowerbeds. All homeowners and businesses around Redding, CT have the advantage of accessing our professional care for flowers and lawn maintenance. Our work includes all aspects of mowing, mulching, tree and flower planting, trimming, and weed control. Since people have different work/business routine, we can customize our services to fit in well with your schedules bi-weekly or on a weekly basis. 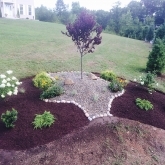 Redding CT is an all-around and all season landscaping company that will ensure your property is picture-perfect all through the spring, mid-summer, and the fall prepping. Call us anytime you have a need! We will ensure your garden and flowers have a pleasant look by protecting them and doing mulching. In that way, we shall lock in the moisture, soil nutrients, and allow sunlight to make your plants healthier. We also provide expert consultation services to help you get the best care for your plants, and then we undertake the heavy labor involved to get perfect results. If you have been dreaming of having a new tree or shrub planted in your home, then you have come to the right place! We have the experience and expertise to satisfy you need for taking care of the existing flowers, shrubs, and trees around your Redding home; while at the same time we shall provide pruning and other maintenance and attention services such as removing dead trees and branches, decaying plants, and cleaning dead leaves. Our cleanup routine includes cutting the lawn, pruning the shrubs, and checking the entire compound for things that need mending. Drop offs and left-overs from storms in Redding should not be your worry because of we also clean after the storm. Redding CT landscaping will be there to ensure that the mess left by the fall is removed from your property. And in case you are suddenly surprised by the spring, we shall be there to take charge of the cleanup and maintenance process. Before the onset of winter, we prepare your property through efficient cleanup, and after the spring, we also remove the spring foliage so that summer finds your home in perfect order. The care processes we provide involve removal of dead plants, fallen trees, branches, cleaning leaves and pruning. To beautify your home and to improve the long-term value of your Redding property, we provide custom landscaping designs that will go beyond your expectations. At Roots landscaping, our professionals will engage with you on a one-on-one to make sure your expectations are met. Before we get down to work, we must have a clear insight into what you want, and then we can choose from trees, shrubs, perennials and all kinds of plants to suit your landscape. We shall also take care of the walkways and the construction of a stone wall if you need that done. Creativity is the guiding principle in everything we do, and at Redding CT we have the diligence and the human resources to accomplish the best for you. All our services are tailored to meet the exact specification of the homeowners or your office. The appeal of your business or office can only be maximized through high levels of skills in commercial landscaping. The look of your office and surrounding is the first impression your prospective customers get. 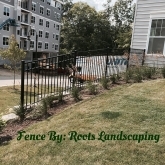 We understand the crucial need for proper fencing, masonry and other projects of landscaping. Our team of expert landscapers will ensure that all your doubts are cleared and what you get is exactly what you desire.